But last week I caught up on Caroline’s post at Un-Fancy on moving away from capsules and it put into words some frustrations with the capsule wardrobe concept that had been swimming in my head for awhile but that I hadn’t been able to articulate. Part of my frustration comes from having my capsule wardrobe on a blog for all to see (obviously a self-inflicted problem). Every time I ditch something I didn’t love or buy something that wasn’t in the “original” capsule, I think about how to rationalize it on the blog. You may have noticed I haven’t done a “Thrift Finds” post in awhile because if I just bought a new shirt and a new dress but my summer capsule was supposed to be set weeks ago…how do I explain that I’m still shopping?? This leads me to the balance of my frustration with capsule wardrobes: my shopping and my style don’t fit in the neat, tidy structure inherent in having a discrete set of clothes for a season. I love thrifting, and while I DO like that capsules encourage me not to buy things I don’t need, if I find the PERFECT summer dress while looking for clothes for my kid or a used LP, I’m not going to not buy it. Thrifting is a long game and this means always being alert to the coups de foudre that will make my wardrobe stronger in the long run. And I like living into my clothing choices, not figuring them all out before a season starts and sticking with that exact configuration until the season is over. I want to tweak and adjust and play. Plus I’m still working on elements of my style – like my winter wardrobe silhouette – and I don’t want to feel stuck if something doesn’t work out like I imagined. So while I’d like to maintain a core of stuff I love, I also want to give myself permission to experiment, swap in and out, and get sick of things outside of that core – the fringe, if you will. And like unto fringe at the edge of a garment, this fringe will be the icing on my wardrobe, not the majority of it. A cohesive style/color palette. A capsule thrives on being able to mix and match most of the clothing so you don’t have to buy tons of pieces to put together a great outfit. I love that this concept gives me a tighter closet that’s super easy to get dressed out of. Bonus to both of these: it’s so freeing to have a manageable amount of clothes in terms of storage, laundry, and maintenance! For those of you who love the visual inspiration of seeing a collection of clothes all playing together – me too! Don’t worry, I’ll still do this. I’ll probably take a page from Caroline and create a visual collage of my “core” each season, and supplement that with more “thrift find” posts. Sound good? What about you and capsules, Thrifters? Were capsules never really your thing? Or did you jump on the bandwagon? If so, are you still madly in love with them or ready to move on? Scroll down to comment! What I have been referring to as a “capsule wardrobe” has been a relatively loose version of the concept all along — I’ve never used the strict structure of shopping/establishing the capsule ahead of time and then wearing those and only those items until the end of the season. (And a big part of the reason was that I didn’t think it would fit with a secondhand wardrobe.) I actually think those rules are more about managing one’s shopping habits/relationship than managing one’s wardrobe — though of course those two things are intertwined in some ways. For me the (1) color palette and (2) sense of how much (or how little) is enough, as you mention, are big parts of why capsules resonate with me. In addition to that is (3) the way that focusing on a seasonal subset of clothes helps me understand better how my wardrobe works together as a whole — that’s harder for me to see when I’m looking at my entire closet at once. And in turn my hope is that this will help me to more reliably make useful purchases because I can see how something will work in my closet (vs. those items that are fun/interesting/pretty/only $3 but don’t really belong). I agree with you that thrifting is a long game, and I think the capsule concept can be a strategy to help me win it. 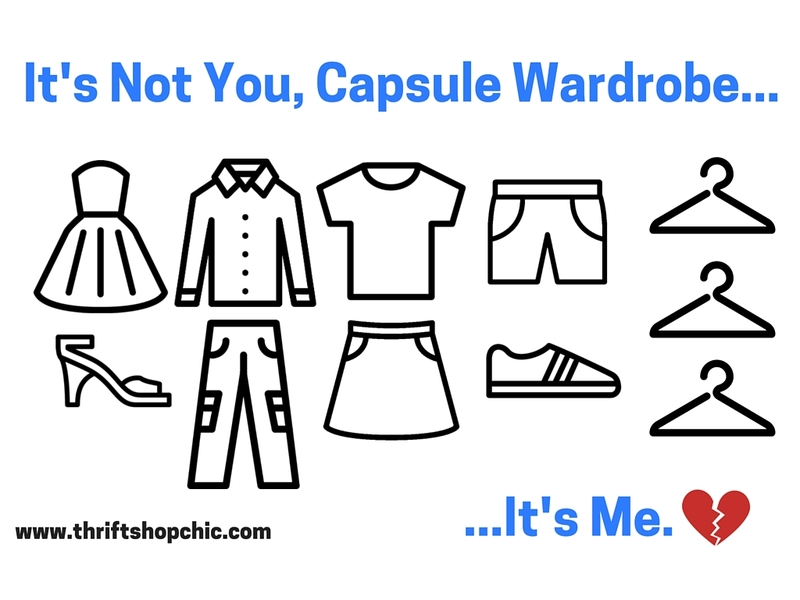 Do you use the capsule concept when you thrift for your daughter’s wardrobe? Sarah, I hadn’t thought about #3 but I think that’s how the way I organize my closet functions – I can see everything for one season in one place (or in one drawer for pants/shorts/sweaters) and it gives me a visual measuring stick for whether a “new” piece will fit (or will duplicate an item of which I already have too much!). For her wardrboe this summer I’ve stuck with mostly shorts + tops that all go together, plus two swimsuits that mix and match, and some church dresses. Happy to take pics if you’d like to see! My closet does not contain a simple capsule wardrobe: it’s not limited at all! However, the concepts I’ve learned following blogs and videos espousing capsule wardrobes have helped me refine and polish my style and color selections! 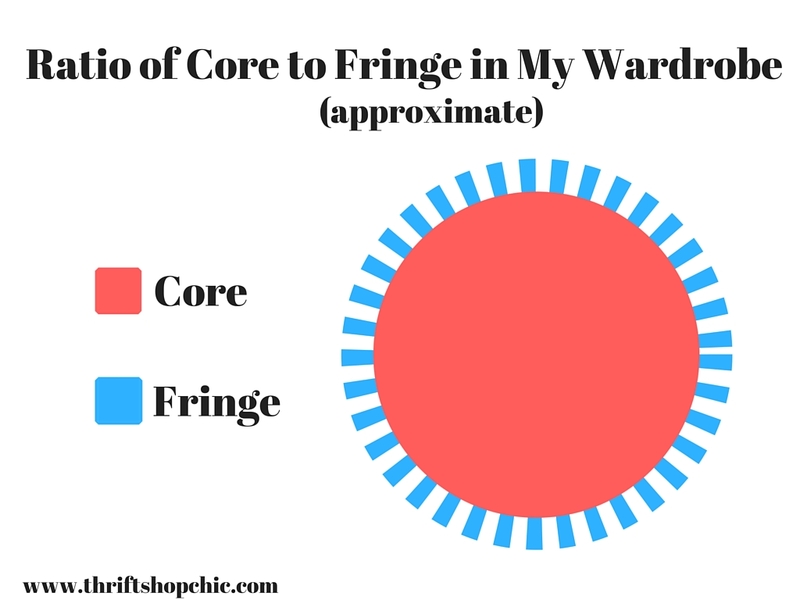 Getting rid of ill-fitting, worn-out or “just-not-quite-right” garments has resulted in no longer experiencing that “nothing-to-wear” panic – my wardrobe is definitely more efficient and functional. AND I can pack for a trip with a lot more confidence!